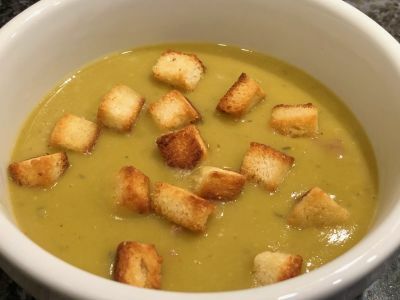 Split Pea Soup is a great meal for a cold winter day. Or any day for that matter. 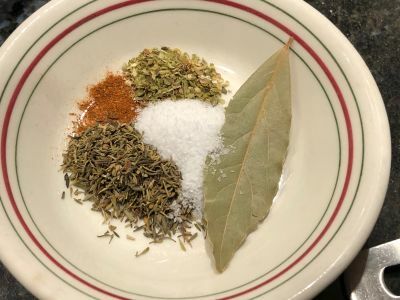 And this version is nice and thick and has lots of flavor from the ham hock and the herb combination used in the soup. And don't forget the Garlic Croutons to sprinkle on top. We just know you'll like this one. Enjoy! 1. 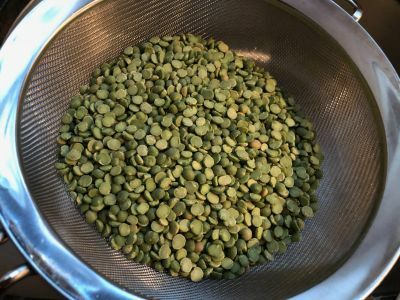 Pour the split peas into a strainer and wash them before use. Also take a few seconds to look through them to make sure there are no foreign objects in the peas like pebbles or such. 2. 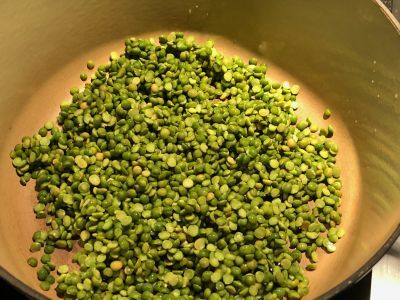 Add the peas to a heavy bottomed soup pot. Enameled cast iron works very well here. 3. 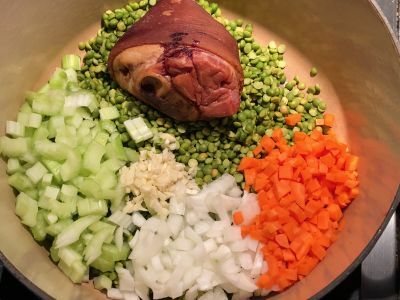 Add the ham hock to the soup pot. 4. 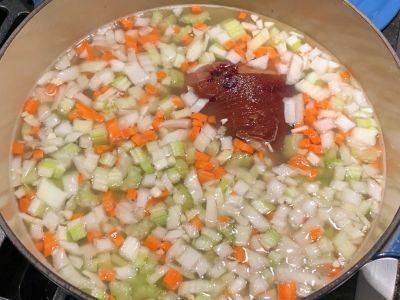 Add the onion, carrots, celery and garlic to the soup pot. 5. Add the stock and water to the soup pot. Stir it thoroughly to make sure none of the peas are stuck to the bottom of the pot. If some of them are, just use a spatula to scrape the bottom and get them all up. 6. Bring it to a boil over medium high heat. 7. Once it is boiling, reduce the heat to medium low, cover the pot and simmer for 45 minutes. Stir occasionally so it doesn't stick to the bottom. 8. After 45 minutes, add the spices and herbs to the pot, stir and simmer for another 45 minutes with the cover off. Make sure it stays at a low boil for the whole time. 9. 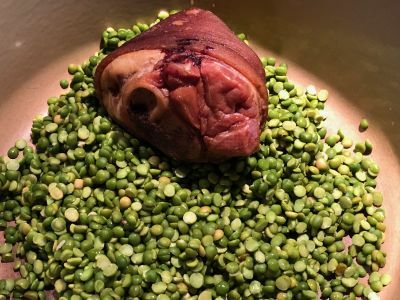 Remove the ham hock and the bay leaf and process the soup with a hand blender (immersion blender) if you want it to be smooth. If not, just serve it as is. 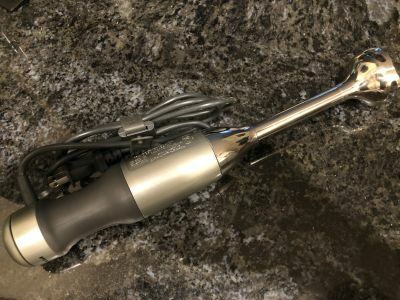 If you don't have a hand blender you can use a regular counter top blender, just add small quantities and start it on low speed or it will splash all over you and that is not good. 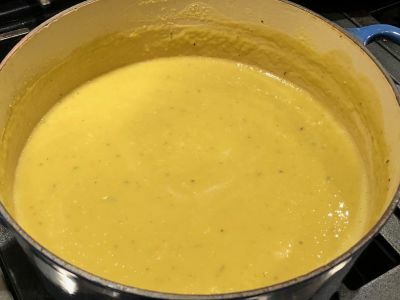 You can get burned very easily doing that.If you are using a regular blender, return the soup to the pot after blending. 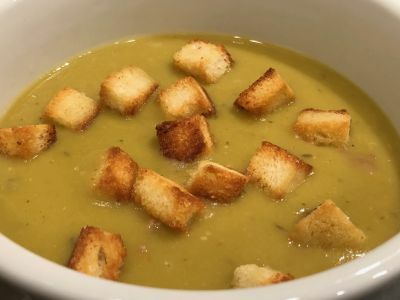 Serve the soup in bowls with croutons, English muffins or garlic bread. Or all of them and let your guests choose which one they want. Enjoy! Love pea soup its the best.